It was a special day. A very special day. 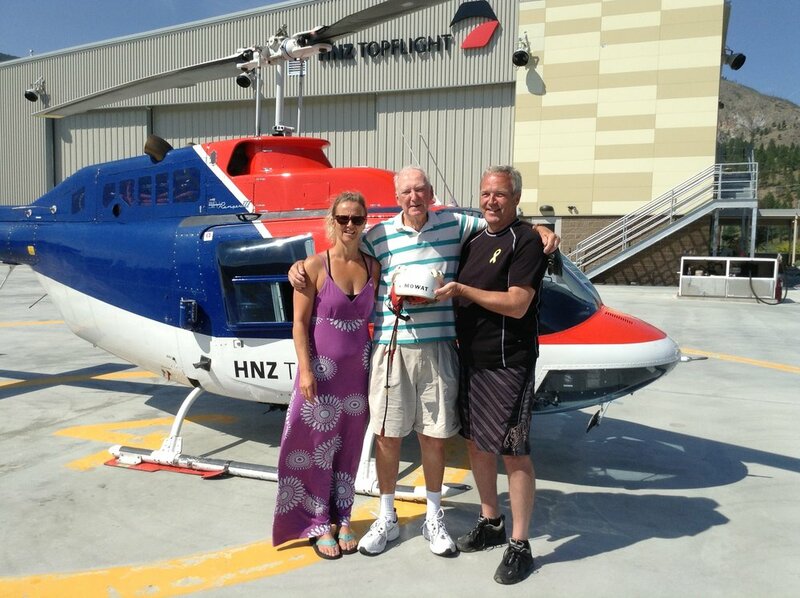 My Dad, aged 84 years and dying of cancer, had imagined flying a helicopter one last time and here he was, climbing gingerly in to the pilot seat of a Jet Ranger at HNZ Top Flight in Penticton. He was wearing a faded old pair of leather flying gloves and a military helmet that he had not worn in almost forty years. The helmet still bore the nickname his RCAF buddies had fondly given him - a mispronunciation of his last name - Malcolm "Mutt" Mowat. Bizarre, weird, wonderful, amazing, or incredible - I was not sure which adjective applied, but I knew it was pretty darn special. That much I knew. My Dad, who was born and grew up in Whitby, had joined the RCAF back in 1952. After his initial flight training, his instructors felt he would be best suited for fighter jets, but not suitable as an instructor. Of course, as was typical with such recommendations, his first posting was an instructor and he never flew fighters! Mind you, the fighters at that time, the F-86 Sabres, were being deployed overseas in an air defence role in Europe and since he was newly married with a daughter on the way, he accepted the role of an instructor with No. 3 Flying Training School at RCAF Station Claresholm in Alberta, teaching on the venerable old Harvards. That daughter, my sister, Sue, eventually joined the CF and became a medical officer, so every thing turned out as it was meant to be. By the 1960s, Dad had already accumulated over 5,000 hours flying some fixed wing multi-engine stalwarts like the B-25 Mitchell bomber; a maritime patrol version of the Avro Lancaster bomber; and the Canadian-made Canadair Argus. While flying the Argus, Dad developed a special knack for spotting Soviet-era submarines out on the ocean. This was a skill a former RMC grad and a pilot himself, Nick Rapagna told me about back in late 1979, saying the aircrew crew had learned to hone that unique ability by feeding him ice cream - maybe it was the sugar rush, but he always had amazing eyesight. After almost six years flying the Argus in Greenwood, with two different squadrons, Dad was afforded the opportunity to cross-train on rotary wing aircraft for the first time, an option which he readily accepted. In 1965, he took his first basic course on helicopters, flying a helicopter similar to the one seen on the MASH television show. For a short time afterwards, he trained on the Sea Kings – yes, those Sea Kings - but switched to the Labrador helicopter when 413 (Search and Rescue) Squadron was transferred from Greenwood to Summerside. Dad flew countless missions with 413 (S&R) Squadron, searching for lost souls or transporting accident victims and sick children to Halifax hospitals. Yet his stories are not about the heroics, but rather ones where he wished he could have done more. One young child had been so severely burned in a house fire that the military nurse pleaded with Dad to fly faster, but all he could do was point helplessly to the airspeed indicator to show the helicopter was already exceeding the red-line speed. Dad also spoke very fondly of his crew, especially the SAR Techs. He proudly recalled one time when they had rigged some sort of Rube Goldberg contraption in order to help relieve the excruciating pain of a man who had broken his back in a car accident. Even over the thundering roar of the chopper blades, he said he literally could hear the relief of the man when their jury-rigged system kicked in. After Summerside, Dad he was posted to VU 32 Squadron in Shearwater flying the Twin Huey. He enjoyed that job, and loved flying, but the one thing he loved the most was coming home, after a long day. Back before the days of smart phones, he had a unique way of letting Mom know he would be home soon for supper, making sure to fly his not-so-quiet Twin Huey directly over our house. Of course, we were still kids at the time, and invariably were outside playing road hockey, so all our friends knew it was him as well, which obviously was pretty cool. Later, he retired and joined the Coast Guard, a new and challenging flying job which included deploying with the ice breakers up north. He was so generous, taking each of us at one time or another for a flight along the east coast of Nova Scotia. I remember vividly one flight to Lunenburg with him. He flew very low along the coastline, revealing a spectacular array of geographical splendour and colour, and then after doing what he needed to do, he landed the helicopter down in a ball field, like he was parallel parking on a downtown street, so we could get something to eat. It was certainly a different time back then. When his father was dying in 1972, he rushed back to Whitby to be with him, but with a family of nine, money was in short supply so on a hunch he had called up the operations center in CFB Downsview in Toronto to see if there were any helicopter flights heading back east. Sure enough one was heading in that direction so he arranged for them to pick him up in a nearby ball field. For Dad, it was fairly "routine" but for the local media, not so much. There was an article the next day in the Oshawa Times Gazette with blaring headlines wondering who the "Mystery Man" was who had been plucked from Whitby, whether it was James Bond on a special mission for the mayor Dan Newman, or maybe a losing Liberal politician escaping the wrath of voters? No, the article said, it was simply the fifth member of the flight crew. However, the best line was from a spokesman from Downsview. When asked by the paper why the helicopter had picked him up in the middle of the town he replied, no doubt with a wry smile, "because that was where he happened to be". When I said it was fairly "routine" for Dad, it was because this was not the first time he had "hailed" a chopper, back before the days of Uber. One summer, in the 1970s, our family went back to PEI to stay at a friend's cottage at Chelton Beach owned by Jim MacLean (the father of Doug, who is a former NHL GM/Coach and a current NHL hockey analyst). Dad was a little short of cash, and since this was long before ATMs, Dad called up the operations center in Summerside and asked if there were any helicopters heading back to CFB Shearwater where he was posted so he could go to a bank there. Sure enough, there was a Labrador helicopter, the same one he had flown while with 413 (S&R) Squadron, flying there later that afternoon. Not a lot of people who had cottages in that area knew who we were, but when that massive helicopter plopped down in the nearby field to pick him up, we instantly became "the talk of the town" or rather the Beach. Dad eventually changed jobs with another pilot in Parry Sound who wanted to come down east, and spent the next ten years supplying lighthouses all along the Great Lakes and Georgian Bay. He again made several emergency flights transporting sick sailors and lighthouse keepers. He was given an award for one of those trips, but he was a modest man and usually the topic only ever came up when somebody else mentioned it. Eventually he retired in 1989, after amassing some 7,000 hours in helicopters, 12,000 hours overall, and moved with Mom to Kelowna after an old RCAF buddy highly recommended the Okanagan as a retirement destination. Sadly, Mom, who Dad first met while she was at the Ontario Ladies College in Whitby, passed away in early 1991 from cancer, an inoperable brain tumour. Dad was always the tough guy, never letting his emotions show, but when they played Mom's favourite hymn at her funeral, he broke down and literally collapsed on the pew in front of us. My three sisters had been in tears the whole time, but my three brothers, like me, were all hockey players - tall, resolute and strong - and had all remained stoic, but when we saw Dad weeping inconsolably, we all lost it. In early 2013, after living alone for almost 23 years, my Dad learned he too had cancer, and only had months to live. His one passion had been golf, and he continued to play at least a couple of times a week. Only recently had he given in to a golf cart, hobbled after the cancer had spread to his hip. That great eyesight never deserted him though - he still could find more stray golf balls than anyone else, a testament to which were countless boxes in the garage, the storage room and carport full of them. In some ways it was surprise, then, that out of the blue, he somewhat sheepishly mentioned to my younger sister Sandra that he would love to fly a helicopter one last time. There were many e-mails among my siblings about how we could make this happen, sometimes ending with an "LOL" when talking about the possibility of him actually being allowed to fly as opposed to maybe just going on a heli-tour. Seriously, an 84-year old man wanting to fly a helicopter again before he dies. Who does that? Really, who does that? I took him very seriously, but just in case, when I was there in June, I asked him about whether maybe he wanted to go for a heli-tour of the Okanagan. He gave me that look of his and said he had 7,000 hours flying helicopters - if he was going up, it was not going to be as a “spectator”. Okay, I thought, this is going to happen, if I can find some company willing to take him up. I looked around and eventually found a company in Penticton, HNZ Topflight, formerly Canadian Helicopters, one which had a long history of training military pilots to fly in the mountains and which flew a type of helicopter that Dad had flown before, the Jet Ranger. I thought those were all good signs, especially the fact that being involved in training they would have helicopters with dual controls and the right kind of insurance. So, I called and spoke with Natalie. She was great and immediately loved the idea. I even managed to find an old picture of Dad on his Basic Helicopter course in 1965 and sent it along. After working out some of the details in terms of expectations, she confirmed that they would not only be willing to take Dad up for a familiarization flight, but that they would be honoured to do so. It was not going to be cheap, but I spoke with my sister Bonnie and we agreed to proceed. We also decided not to tell Dad how much it cost. Having come from the Depression era and having supported a family of nine on a single income, he was always very careful with his money. I flew out again to see Dad in late July, having arranged the familiarization flight for Tuesday, the 30th, but without telling anyone at this point. I waited for the right moment and then told him. He took a couple of minutes to let the reality sink in, and at first said he was not sure, because he was feeling "peculiar", which obviously concerned me. However, when he said Tuesday was not good - because he had a “grease job” scheduled for his van that he had had to cancel once already - I knew that was a good sign. That was his way of telling me this was more about confidence than health, i.e., “thinking about flying again” turning into maybe “actually flying again”. Given his initial hesitance, I decided to drop the issue for a day or so. I knew Dad well enough to know there was a side of him that really wanted to see if he could do this. On Monday, I asked him about it again and he said “maybe” Wednesday, because he gets very tired after his golf game on the Monday. Although I was worried this might be problematic with the company, I said okay, I will see what I could do. Much to my surprise, Natalie came back and said HNZ was still very willing to do the flight, so much so that they even agreed to waive the cost for the flight in honour of Dad's extensive aviation history. In fact, unbeknownst to me until later, everyone there thought it was such a cool idea that the pilots had actually been vying with one another to take him up. I knew that the fact that HNZ was willing to do this for free meant an awful lot to Dad, but I was still not sure that he would actually go. So, when I got up on Wednesday, I decided not to say anything about the flight and instead just quietly went about having some breakfast. He did not say anything to me either, but after he came downstairs, I watched as he slowly made his way over to a file cabinet that he had in his office and opened the top drawer. He reached in, and rummaged around a bit and then pulled out an old pair of brown leather flying gloves and turned around and put them on the kitchen counter. I thought to myself "awesome" - actually more like "*&"$% awesome!" - he is going for sure - so I ran downstairs and grabbed his old flying helmet and threw it in the back of the van. I knew he must have been pretty focussed because he even let me drive down to Penticton. When we got there, Natalie greeted us warmly and introduced Dad to the Instructor, Vern, who asked if Dad had brought his own helmet. I had left the helmet in the car, in part because Dad had not been sure that the connections would still be compatible and in part because for some strange reason I thought they might think it weird. But, they were all great. Vern took a quick look and figured the helmet just needed a minor modification to the microphone, something which their engineer quickly sorted out, and everything was good to go. Vern took him in to the classroom and gave him a short, and actually pretty amazing history of mountain flying, as well as some background on the company and then briefed on the flight and then said "Let's go flying!" I sat in the lounge with Heather, a heli-tour pilot from Newfoundland who had also flown transport missions with the company in Afghanistan. She noticed that Vern had put Dad in the pilot seat, which judging from her reaction was a good sign. After going through the various take-off checks, the Jet Ranger lifted off a little hesitantly at first, but then smoothly taxied a couple of feet off the ground towards the center of the air field for another hundred yards or so and lifted up and headed out to the north. Heather was pretty sure Dad was doing the flying and seemed quite impressed so of course I was filled with pride - wow, he is doing it! My sister Sandra came in shortly afterwards, along with her husband Wes and son Isaac and started taking a video with her iPad of Dad flying the helicopter on a couple of circuits, then hovering on the infield, before rotating 90 degrees to the right and then back 90 degrees to the left. On the video you can hear Sandra beaming - "Oh my God, look at him, he is showing off!" After he landed, about 35 minutes later, he had this huge smile on his face, part relief and part incredible satisfaction. Vern was a very laid-back kind of guy but he had a huge smile as well and laughed, saying something like he was so stoked because he had just flown with the oldest "student" ever at the school. Dad thought he was great, and had the perfect temperament for an instructor. We took photos - the traditional "grips and grins" and then went back in the lounge. Natalie was quite taken by the whole experience, saying she had goose bumps all over her body. My sister was overcome with emotion, barely able to say, between tears, that this was the only thing Dad had said he wanted to do before he left this earth and here he had actually done that. It was all quite surreal, and yet very real for Dad. On the way back to Kelowna, we stopped for a coffee at the Tim Horton's on the outskirts of Penticton. His lengthy retirement coupled with the cancer had sapped him both physically and mentally, but that short flight seemed to completely restore his confidence. I do not think I realized how much until he confessed to me over that coffee that all he had wanted to do was be able to hover the darn thing and here he had flown the whole 35 minutes. That's when he said "Geez, I could get a flying job tomorrow!" and that's when I knew how much it had really meant to him. I did not know what to say, but I knew one thing. I knew that it had been a special day. It had been a very special day.